Christopher Callaghan and Billy Callaghan – a father and son from Huddersfield have to pay a heavy price for dumping their waste. They pleaded guilty to fly tipping waste under Section 33 Environmental Protection Act 1990 at Huddersfield Magistrates Court on 15 July 2015. The men were witnessed fly tipping the waste on George Street, Milnsbridge on 17 August 2014, the witness then reported to the crime to us. Evidence was gathered and a case brought against the men who admitted to dumping items from a property that Christopher’s daughter had just moved into. The court fined Christopher £230 he also had to pay a £22 victim surcharge and £669.10 legal costs. Billy was fined £190 and was also made to pay with £20 victim surcharge and £669.10 legal costs. 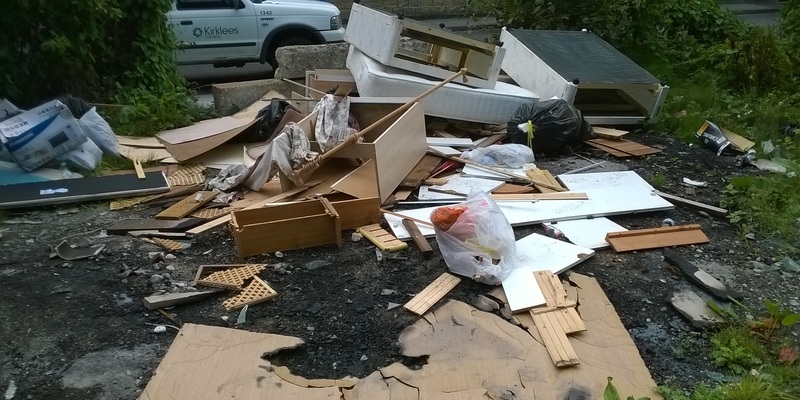 The council has managed a conviction of one of the many fly tippers. I would suspect that the actual cost of bringing this case to court is far in excess of any fines that have been imposed. In addition to the cost of clearing many other cases of unresolved fly tipping, that is claimed to be expensive. Only if the council provided facilities that enable residents to dispose of their rubbish, instead of restricting the facilities and wondering WHY people Flytip. Is that it? Is that the fine? I bet they were straight in the pub laughing their socks off. And the council seemed overjoyed with the results. They will fine you a damn sight more for not paying your council tax. Pathetic.